With Vyond, anyone can make media that moves. Built for professionals of all skill levels in all industries, Vyond lets you create dynamic videos for any audience. Distributed workers and diversity challenge the enterprise. Vyond lets you create characters to fit any context. 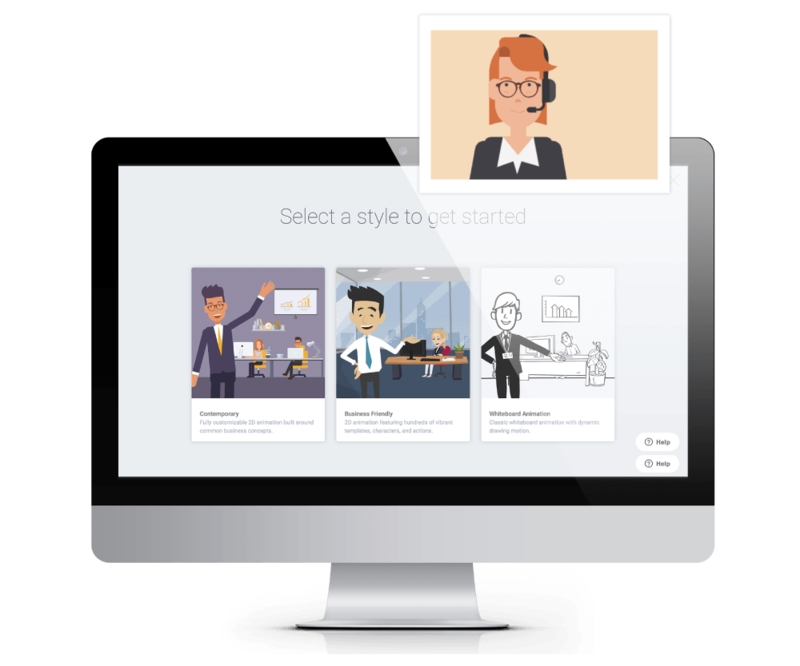 From specific jobs and workplaces to casual environments, Vyond gives you modern casual settings and whiteboard animations for hundreds of combinations to address your employees around the world. Create MP4s or animated GIFs in a click. Host them wherever you like or import them into other platforms like Storyline or Captivate. Your videos can be anywhere you want them to be. Your ROI from media and communications has to be clear. Vyond’s pricing and flexible plans allow more control and transparency over your communication costs — saving you money and time. Don’t let tight timelines and small budgets stop you from making something moving. Vyond is easy to use and less expensive than traditional video production. We also provide a bevy of resources, training options, and an active customer community to help you along the way. Prebuilt templates get you started with ease. Our extensive library covers a wide range of industries and scenarios, so you’re sure to find something that fits your needs. Customize them with characters, color, and text. Add voice and music — and you’ve made your first video. See and do. With drag-and-drop controls and a whole suite of features like character lip-sync and a library of royalty-free music, anything is possible. Need to educate your staff on a new product? Recognize an employee’s tenure? How about a quick tutorial for your help desk or something to make your social media content stand out? Vyond has the tools to make it happen fast and easy. For teams all over the globe, the scalability of the Vyond Studio allows you to create content at speed to roll out new initiatives and get work done. Use our templates or make your own. Add dynamic charts, graphs, and transitions, and you’re ready to communicate your idea with the world. Inspire your team for any scenario, regardless of size or industry, and improve the way you communicate. From scenario-based training to microlearning, video is the best way to engage your learners in a truly captivating way. Vyond is compatible with the top learning management systems, making it easy to incorporate video into your existing content and significantly improve learning outcomes. Vyond’s flexible platform helps you create dynamic content for social media, email campaigns, landing pages, and more. Increase conversion rates and improve marketing results for any audience. Easily export your videos and watch the results roll in. It’s more critical today than ever to be certain your employees receive and understand policy. Vyond supports all of your employee engagement initiatives, from onboarding to internal communication, by giving you a better way to grab and hold attention. Video improves employee results and ensures that your message gets across. No matter your industry or job role, you can use video to drive positive results. Vyond is a robust platform that fits the needs of your business by allowing you to create your own dynamic videos, customized to your brand, easily and cost-effectively. For Enterprise. For Everyone. In a Secure Environment. Create media that doesn’t hurt your bottom line. Your team gets up to speed fast with prebuilt templates, a library of resources, and a full suite of collaboration tools. Transform the way your organization communicates. Vyond makes video creation accessible to everyone who needs to engage and captivate an audience. Videos transform your static content into dynamic media and move the needle, whether your success metric is clicks, purchases, or awareness. Our team is focused on information security and data privacy, and we apply the highest standards to protect your data and personal information. Take the Vyond Studio for a test drive and create your first video today. Transform your ideas into an inspired reality.